Forty years ago today, on July 20, 1976, NASA’s Viking 1 spacecraft landed on Mars. 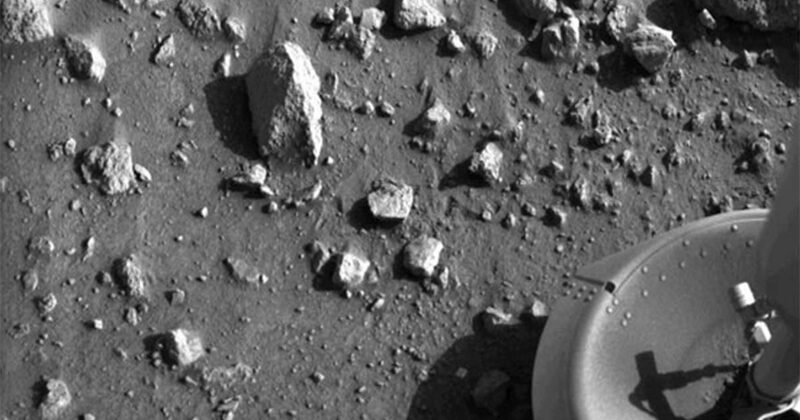 Viking 1 was programmed to shoot the first closeup photograph of another planet as soon as it touched down and immediately transmit the picture back to Earth. Meanwhile, at the Jet Propulsion Laboratory in Pasadena, California, a couple hundred astrophysicists, engineers, politicians, and journalists stood in front of a blank television monitor. Until a picture appeared on the screen, there was no way to know if the spacecraft had survived its multimillion-mile journey. Finally, a thin line of black-and-white pixels scanned in across the top of the screen. The line of pixels was followed by another and then another, and another, and another, and another, but minutes later It was still impossible to make out an image. A swell of giddiness surged through the room. The crowd exploded into wild cheers. It was one of those once-in-a-lifetime highs you never quite come down from.